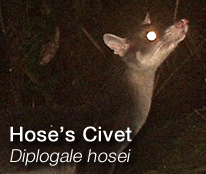 HOSCAP Borneo releases new footage of the Hose’s Civet. The HOSCAP Borneo team welcomes a new volunteer! After a few busy months in the office and classroom, the HOSCAP Borneo team have returned to the field to retrieve the next batch of images from their camera-traps.